EHR maker and pharmacy, which already work together on patient care, will share data and direct patients to lower-priced medications. EHR giant Epic Systems and CVS pharmacy are working together to boost access to lower-cost drugs for patients. Employing analytics and data sharing, the partners say they will spotlight the lower-cost alternatives for prescribers. CVS Health will tap Epic's Healthy Planet population health and analytics platform to generate insights surrounding dispensing patterns and behaviors around medication adherence. CVS Health, which has 9,700 retail locations and more than 1,100 walk-in medical clinics across the country, already works with Epic, to support the CVS MinuteClinic nurse practitioners and CVS Specialty's care management programs. Troyen A. Brennan, MD, chief medical officer at CVS Health, sees the collaboration growing in the future. "This new relationship will help us further expand how we work with Epic and providers on their EHR system to develop meaningful tools and programs that will ultimately help us take even better care of the patients we support,” Brennan said in a statement. Epic Vice President of Population Health Alan Hutchison sees the partnership with CVS as a way to knock down silos while adopting new ways to provide better care, and reduce administrative overhead while also lowering costs for patients. The new collaboration aims to bolster prescription decision-making for patients and their care teams, including physicians, pharmacists and health insurers. As the partners see it, real-time benefit information and electronic prior authorization at the point-of-prescribing will help improve patient access to medications and also ensure their prescribers are aware of prescription insurance formulary status and less expensive alternatives when appropriate. 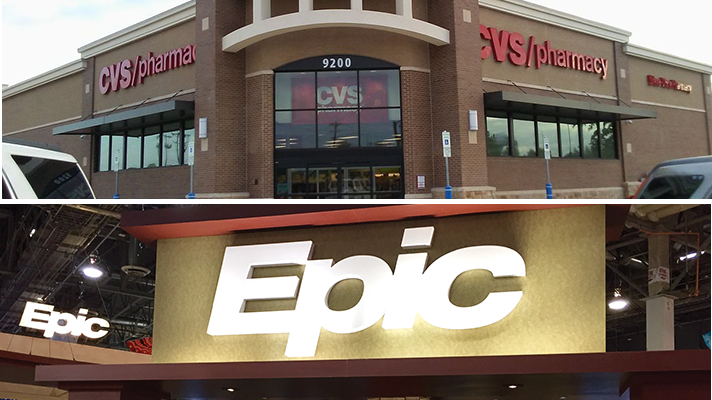 "This collaboration with Epic will enable us to continue to drive technology innovation beyond the pharmacy to the full health care system," Stephen Gold, chief information officer at CVS Health, said in a statement. CVS and Epic also plan work on streamlining and improving data sharing and linkages across the healthcare system, Gold added. The goal, he said, is to improve communication and connectivity among patients, physicians, the pharmacy and health insurers.